Paying it forward with Dan’s mentor Jim Gagne. Let me tell you a story about my mentor. Just weeks after I arrived in New Hampshire – no friends, listless, clueless – I was wandering around the Londonderry firehouse looking for stories (but mostly wasting time) when I heard about this guy who was going to be climbing Mt. McKinley in Denali National Park. Back then, I didn’t know the difference between Mt. McKinley and President McKinley, but feeling desperate, I called and set up an interview. 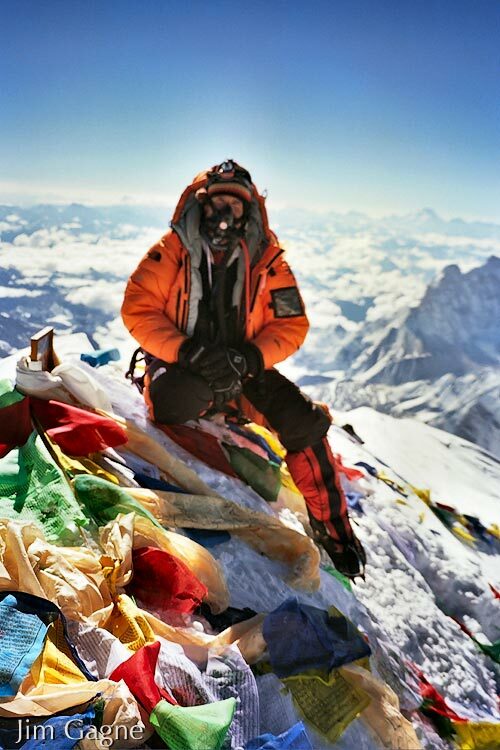 Jim Gagne was pursuing the seven summits, where climbers of very high skill attempt to summit the highest peak in each of the seven continents. Again, if I had known what any of that meant at the time I would have been impressed. And perhaps it was the fact that I didn’t that led Jim to suggest that, when he came back from Alaska, perhaps he could take me on a little hike. Looking back, of course, Jim Gagne inviting you to hike with him is like Steven King suggesting the two of you jot down some notes or Usain Bolt wanting to do a little jog around the track with you. But I knew only that I was lonely and this was a chance to make a new friend. So I went. 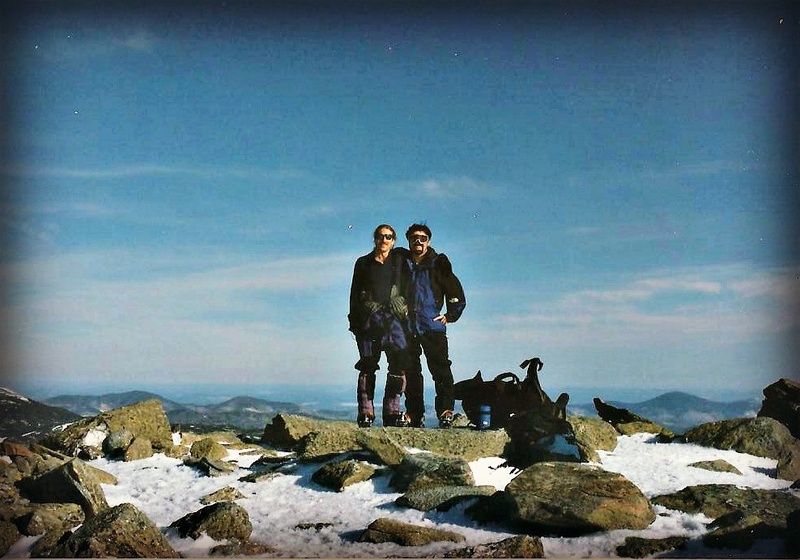 For my first hike in New Hampshire – never having set foot, or really even seen, a mountain – Jim took me up the caretaker cliffs of Cannon Mtn. to the Old Man. I puked. The hand over foot “trail” shot straight up the I-93 side of the cliffs and it took me forever to pull myself up there. But as I stood atop of what was the Old Man’s forehead and looked down into the notch, Jim just stood back, not saying anything. Something inside me flicked on that day, a hidden flame I never knew existed. That feeling, that moment, is forever seared into my psyche. Never before or since has my body been so thoroughly exhausted. I was unable to walk the next day, or the day after that. I called Jim from bed and told him he had to bring me lunch because I couldn’t move. He said, “Stop being so dramatic, where do you want to hike next?” We climbed Mt. Tecumseh, which was pleasant, but I wanted more. So, in late March, with a heavy snowfall still in the upper slopes, Jim took me up Mt. Washington. The third mountain I ever climbed, in winter conditions and below freezing temps, with no experience, was Mt. Washington. It took us 14 hours. Jim on the summit of Mt. Everest, May 26, 2006. Photo courtesy Jim Gagne. I summitted Mt. Washington that day, so tired that in my summit shot I’m sitting, not standing, by the sign. Jim took all the weight out of my pack and in some spots on the way down we had to take ten or fifteen minute breaks because my legs just would not work. I’m convinced that the only reason he took me up there was to practice rescue training. But I did it, and nearly everything I now know about teamwork, patience, preparation and determination, I learned in that one hike. Everything since has only been about improving upon that 14 hours of my life. Since that day, Jim and I have hiked again and again, here and there. He was with me when I touched the summit of Mt. Adams to complete my 48th 4,000-footer. I still vividly remember the late night at my desk at work, waiting for emails to update me about Jim’s progress up Mt. Everest. I yelled out loud to that empty room when the email came through saying he’d made it and was heading down. Jim’s success as a mountaineer is impressive, but those are feats I can only marvel at from afar. It’s something deeper, though, that I have learned from him; his joy of the natural world, his endless optimism even in the face of the extreme, his deep preparation and understanding of whatever he sets out to do before he does it. I will never reach the summit of Mt. Everest. But the lessons I’ve learned from Jim have allowed me to get to Mt. Everest Base Camp. Those same lessons I have applied with all my might toward Janelle in the hope that Jim’s legacy will be passed forward and shared, and that perhaps, someday, she’ll do the same. And now, my relationship with my mentor will come full circle as, this Sunday, Meena and I will go to Denali and walk in the shadow of that great mountain. We can’t reach the summit. But we will (hopefully) look up from below and think about all the family, friends and, yes, mentors like Jim, who played a role in getting us there, in helping us live this amazing life. During our Book Release Party two weeks ago Jim was on my mind as I was setting up. 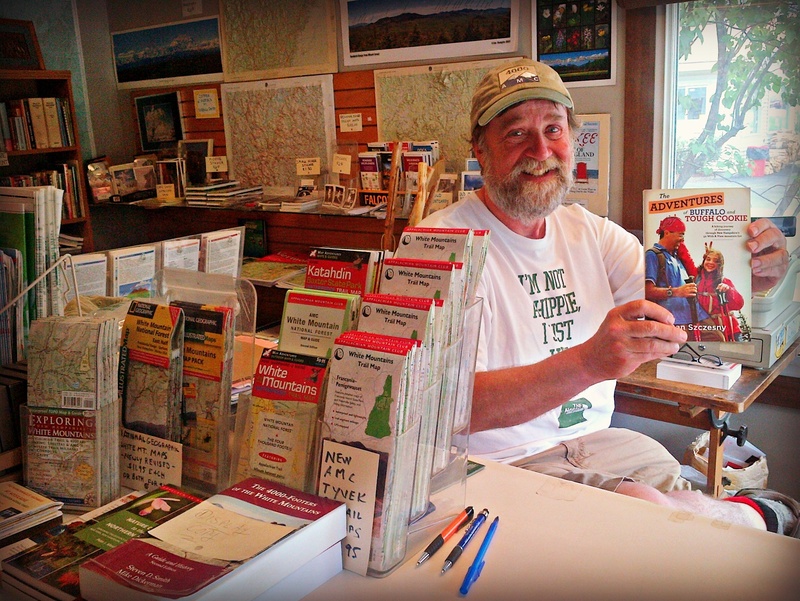 I hadn’t spoken to him in a few months and I knew he had a big trip to the Tetons coming up. But he came anyway, and congratulated me. And once again, as he always did, deflected any of his own accomplishments to highlight someone else’s. That’s who he is. That’s who I’d like to be. So, in a couple days, as I awake in Denali and look up in awe at Mt. McKinley, with the woman I still can’t believe is my wife at my side, I will think of all of you who helped get me here, and have been wonderful friends, and be thankful. In the days ahead, I’ll make every effort to stay in touch. But like most adventures, not knowing what’s around the corner comes with the territory. So, thanks all, see you soon, and onward to Alaska! Jim Gagne and Dan Szczesny near Lion’s Head on a hike up Mt. Washington in March 1999. I’m often asked where it started. Passions have beginnings. In The Adventures of Buffalo and Tough Cookie I write about Janelle’s spark being ignited atop Bald Peak, and the stunned amazement in her eyes as she summitted her first “real” mountain, Mt. Kearsarge. My own connection to the hills, like Janelle’s, was facilitated by one person who took me under his wing, and with a great amount of patience, taught me how to love the mountains safely; with due respect and humble regard. And so, this past week, I began a project that Meena has been suggesting for a long time, a biography of my own mentor Jim Gagne. This will be a slow burn, fit in between the rest of life – a tale told without urgency or deadlines. Jim unexpectedly came to our Book Release Party at Gibson’s last week, and it occured to me then how responsible his teaching is not just for my love of the hills, but for the man I am today. So, next week, I’ll post a longer excerpt from the Introduction. But for today, just a taste. “So, in early March, with a heavy snowfall still on the upper slopes, Jim took me up Mt. Washington. The third mountain I ever climbed, in winter conditions and below freezing temps, with no experience, was Mt. Washington. It took us 14 hours. Launch week, signing whirlwind and Amazon! 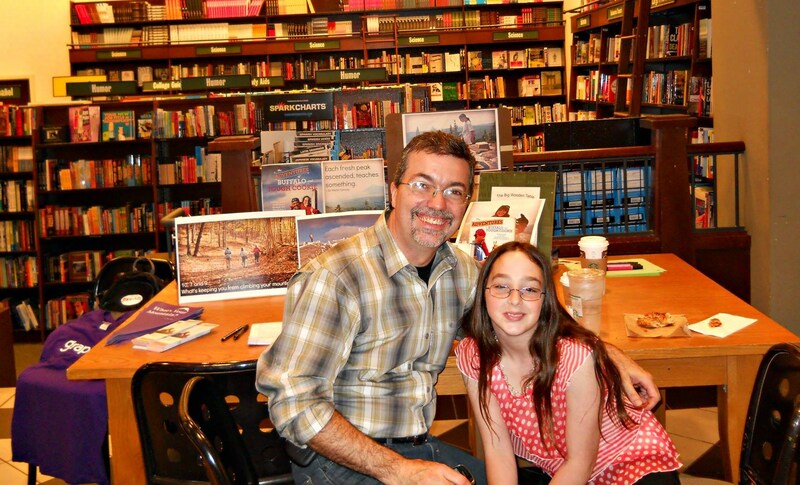 Buffalo and Tough Cookie at their signing table at Barnes and Noble. Thanks to Dave “Bear” Lynch for the picture. Well, that was exciting! 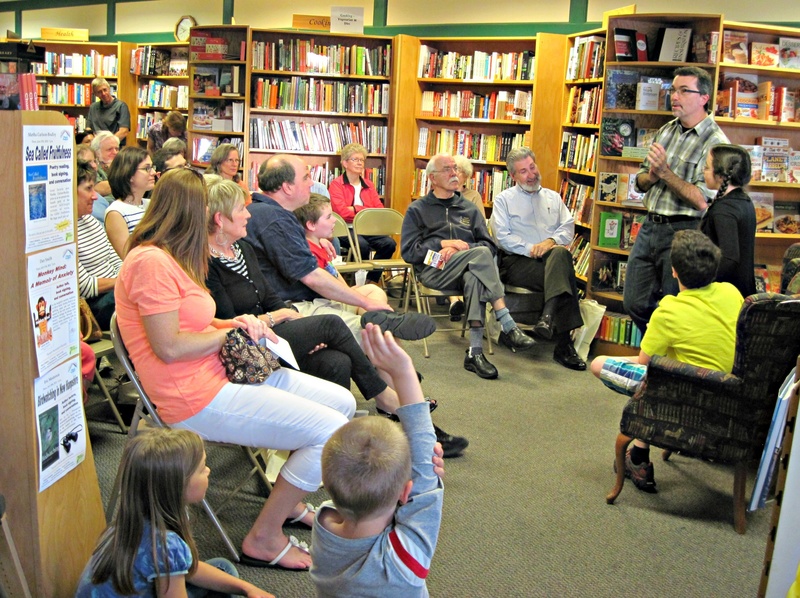 Between the wonderful crowd at Gibson’s, the amazing interview with Arnie Arnesen and the great response at Barnes and Noble, we could not have been happier with our first week. And now, yesterday, our book went live on Amazon AND we already received two positive reviews. This is dreams-come-true territory we’re exploring here. We won’t keep you today as we have lots more to do in the next couple days. Just check out our events schedule. Odds are, we’ll be coming to a neighborhood near you! And of course, now that we’re up there in the cloud that is Amazon, stop by and give the book a review. Here’s the link to Amazon: The Adventures. We’d love to hear what you think, and we’d appreciate it as well. Cheers! Janelle and Aaron both took part in an engaging Q and A after the reading. Photo courtesy of Gibson’s. Big thanks to the folks at Gibson’s in Concord for honoring us with a fine, well run and exciting launch party at the bookstore. A great crowd turned out and we loved meeting you all. It was especially nice to finally meet in person some of our hiker Facebook friends. 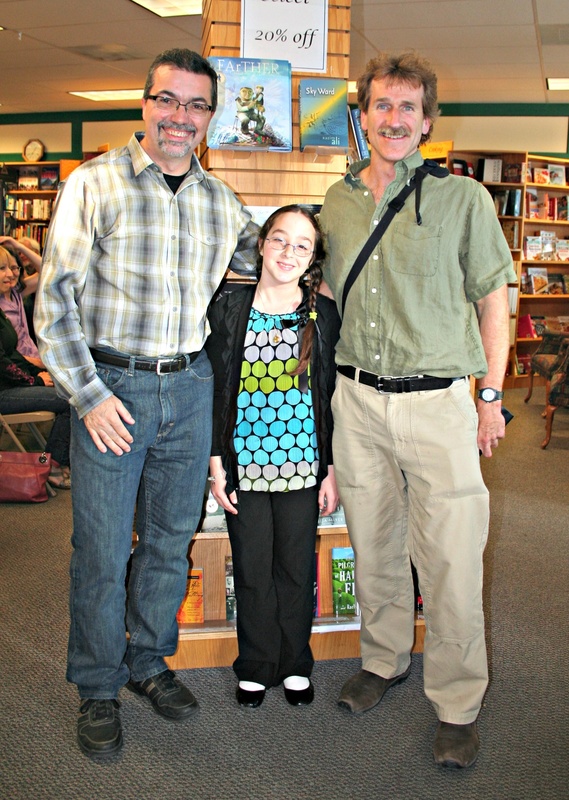 There are some signed copies of the book at Gibson’s if you missed the event! Speaking of books, The Adventures of Buffalo and Tough Cookie is now available at a bookstore near you! Or should be! If your local bookstore or library does not yet have a copy, ask them why and demand they order some immediately. If you’d like to get a copy, you have three options. Next up, Barnes and Noble. Please join us today, June 14, at Barnes and Noble in Manchester, South Willow Street near the mall, from 4-7pm for a special Father’s Day event. We’ll be up in the cafe, meeting and greeting and sipping coffee and hot chocolate. Nothing formal, just there to chat. We’d love to meet you, and talk about hiking, mentoring or just about whatever is on your mind. It’s time to spread the word. See you soon!